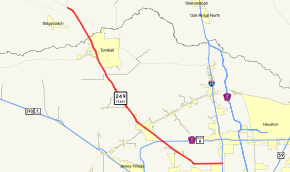 State Highway 249, SH 249, the Tomball Parkway, Tomball Tollway or West Mount Houston Road is a generally north–south highway in Southeast Texas. The current northern terminus of the highway is in Pinehurst at the intersection of FM 1774 and FM 149. The Southern terminus is in North Houston at Interstate 45. The section of SH 249 north of its junction with Beltway 8 is referred to by area residents as the Tomball Parkway because it leads to and is the main road through Tomball. Along the east-west section between I-45 and West Montgomery, it is called West Mount Houston Road. West Mount Houston Road, however, actually extends east past the intersection of SH 249 at I-45. Opened April 12, 2015, Tomball Tollway Phase 1 is 6 miles (9.7 km) from Spring Cypress Road to FM 2920 with three lanes in each direction that are used to bypass seven stoplights and will only accept electronic toll-tags (EZ Tag, TollTag and the TxTag) as no cash payments will be allowed having a total cost of $1.50 for the entire length of the tollway, while the frontage roads will remain free to all drivers. Planned extension from Spring Creek to the county line. Originally a part of FM 149, the highway was given the designation of SH 249 in 1988. The highway's importance grew after Compaq Computer Corporation (now known as Hewlett-Packard) moved its headquarters close to the intersection of SH 249 and Louetta Rd. In 2003, a portion of SH 249 in Tomball was renamed Bus. SH 249B from Hicks Road to Holderreith Road. This is because of bypass that bypasses Tomball on the west side of the city. Previously, SH 249 was designated on June 22, 1937 from then-SH 73 (now Interstate 10) near San Felipe north to the Brazos River. The route was redesignated on May 9, 1940 as Texas Spur 99. The route became part of Farm to Market Road 1458 on January 20, 1966. Current plans call for the highway to extend to the Bryan–College Station area. Continued growth in the Bryan/College Station, Conroe and NW Houston regions have congested existing roadways, including SH 105 and FM 1774. Texas A&M University and businesses in the Bryan/College Station area would benefit from faster connections to Bush-Intercontinental Airport, the Port of Houston and the Texas Medical Center. A bypass of Magnolia, Texas is desirable because of the large traffic load every October due to the annual Renaissance fair. Decreased funding for road projects in recent years had stalled the extension of SH 249. However the rapid growth in the area has led to a renewed push in 2012 to build further segments. Phase one runs from just north of Spring Cypress Road, the current terminus of the existing free lanes to just north of the existing Tomball bypass. The existing lanes have become frontage roads and are not tolled. Phase two will extend the tollway into Montgomery County to FM 1774 at Pinehurst. This $335 million project will be overseen by the Harris and Montgomery County toll road authorities. Construction of phase one began in fall 2013, likely in parallel to the construction of SH 99 phases F-1 and F-2. SH 99, the Grand Parkway, intersects SH 249 around Boudreaux Road. These sections opened on 12 April 2015. The construction of phase 2 will begin in fall 2016. Plans for the middle segments (Pinehurst-Todd Mission) and north segment (Todd Mission-Navasota) have been revived by the Texas Department of Transportation in early 2013. TxDOT has formed a working group with local officials and stakeholders to discuss alternatives for the SH 249 corridor. The Eli Young Band references "Highway 249" in their song 'Always the Love Songs'. Several of the band grew up in Tomball, right off SH 249. FM 2920 / Bus. SH 249 south (Tomball Parkway) – Tomball, Hooks Airport / Alice Rd Current - Last free Southbound exit before entering the Tomball Tollway. ^ a b Transportation Planning and Programming Division (n.d.). "State Highway No. 249". Highway Designation Files. Texas Department of Transportation. Retrieved 2008-03-13. ^ Harris County Toll Road Authority. "Tomball Tollway". Retrieved April 9, 2015. ^ Slotboom, Erik (2003). Houston Freeways. OF Slotboom. ISBN 0-9741605-3-9. ^ Texas Highway Map (Map). Texas State Highway Department. 1938. ^ Transportation Planning and Programming Division (n.d.). "State Highway Spur No. 99". Highway Designation Files. Texas Department of Transportation. Retrieved 2008-03-13. ^ "HCTRA Projects: SH 249 Phase 1". ^ "HCTRA Projects: SH 249 Phase 2". ^ "MCTRA Projects: SH 249". TxDOT. January 20, 2016. Retrieved April 20, 2016. ^ Winkler, Liza (December 11, 2015). "TxDOT holds public meeting on updated Hwy. 249 extension plan". communityimpact.com. Retrieved April 20, 2016. ^ "TxDOT Projects: SH 249". TxDOT. April 3, 2014. Retrieved April 20, 2016. ^ a b c d "Interactive Map of Houston Toll Roads". Harris County Toll Road Authority. ^ a b Transportation Planning and Programming Division (n.d.). "Business State Highway No. 249-B". Highway Designation Files. Texas Department of Transportation. Retrieved April 16, 2015. ^ a b c "249 Toll Extension Schematic - From Harris county into Montgomery county" (PDF). TxDot. ^ a b c d "Aggie Highway Schematic (249 Toll - From Montgomery/Harris County line to the Montgomery/Grimes County line)" (PDF). TxDot. ^ a b c d e "SH 249 - Todd Mission to Navasota with Schematics (249 Toll - From Montgomery/Grimes County line to SH 105)". TxDot. This page was last edited on 28 December 2018, at 19:32 (UTC).